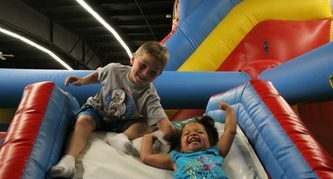 At Jump N Joy we want everyone to have fun, so we not only offer times for birthday parties but also for open bounce, fundraisers, just-for-fun, baby showers, and any other event you request (To give the kids something to do!). Your child will also have access to kid-friendly video arcade games before and after your party or event. 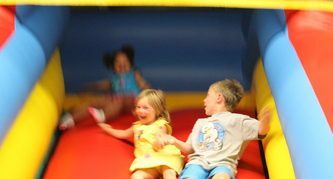 We know that kids like choices so we have FIVE different bounce houses, arcades, and fun items placed throughout the 5000 square feet of space for the children to explore and enjoy. 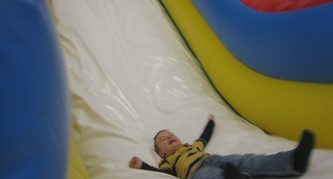 **If you stay with your children, it is normal price…so stay as long as your kids can bounce for $10. We reserve the right to close early on days with low attendance, so please call first if you plan to come towards the end of the session. Please remember that there are no shoes (including flip fops) or bare feet allowed in the play area, so please make sure to bring extra socks for yourself if you do not have some we have them for sale for $2 a pair. Everyone is required to wear socks or slippers. Thank you for your understanding to help us keep our uplay area clean. We strive to keep everything as clean as possible for you and your family. We sanitize all our toys and jumpers on a nightly basis. We offer free Wi-Fi for parents. Please remember to wear socks…no one will be allowed to jump without them. 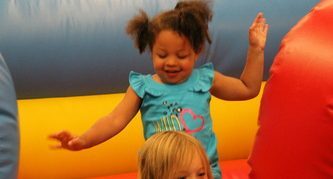 Please check the website regularly as open bounce times may change. Stay up to date on specials and events!